Life is strange. But without all of the weirdness and eccentricity, I don't think it would really be worth living It wouldn't be original. Originality and the meaning of art plague Sarah, a sixteen-year-old high school student who suddenly can't draw anything, despite her prodigious talent. Nothing is original, she tells herself. And if you're not original, you're not worth anything. School isn't original, so Sarah stops going to school. Why bother? As the days of her truancy stack up, she evades her parents' nagging about that totally unoriginal school--the place with Miss Smith and Vicky the grand-prize-winner and the ruined headdress--and sets out to find art by rambling through the neighborhoods of Philadelphia. Aimlessly riding the bus and having rechristened herself Umbrella, Sarah is shocked to meet a ten-year-old version of herself. Then, she meets 23 year old Sarah, and finally, 40 year old Sarah. Although this is exceedingly strange, it's also comforting. At least she survives ... right? Sarah's past and future selves gently nudge her toward tearing down the wall that she's built in her mind: the one that hides what really happened on that family trip to Mexico. The trip after which her older brother, Bruce, never returned home. The trip that simultaneously changed everything and left it all exactly as it was before. Zippered up. Hidden. Ashamed. But it doesn't have to be that way anymore--it can't remain that way if Sarah is going to find herself and rediscover the truth in the art of the mundane. She has to look into the whirling, dirty, garbage-laden tornado that is her family and rescue herself. 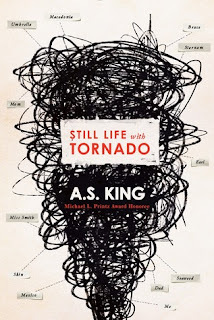 Like the song Sarah plays on the piano, Still Life with Tornado is a melancholy book. It, too, discusses death: death of love. Death of innocence. Death of illusions. But it also demonstrates the amazing capacity of the human brain to protect itself from pain and to bounce back from the most painful of injuries. Just now, as I was writing this, I wondered why I cried at the end, aside from the fact that I am vaguely certain that King likes it when readers' hearts are shredded. I said to myself, "I'm not an artist. What do I know about creating things?" And I realized that I was lying to myself. Right now, I am creating. I'm not writing for a living or to sell books, but I write to let my feelings out of my heart, because if I left them inside, I would be emotionally destroyed (as if I'm not already, but let's just flow with this right now). And right now, I feel a lot like Sarah. I'm wondering what the point of this whole writing/blogging/reviewing/creating jig is. My secrets are not Sarah's secrets. My problems are not Sarah's problems. I've never even been to Mexico. But I feel like my best critiques came from a different person. A funnier, less depressed, less jaded person. Right now, I'm going through the motions, and it makes me queasy. But I'm not going to wander the city on the bus system (which is a colossal joke) or follow a street artist/homeless person in order to find my inner art. What I will do is continue to read. I might not write as much, because it doesn't feel like an authentic expression anymore. But that's okay. Because art is all around is. It's life in all of its messy glory. It's the things we hate just as much as it is the things that we love. It's complicated and yet crystal clear. It's the juxtaposition of chaos and repose in a still life with tornado. I received an ARC of this title from the publisher. P.S. : I hope to read this one soon!